So where is the well? Apparently, none of the cottages were on the mains water supply until the 1970’s. Until that point, water was collected from a spring 200m down the road using a barrel and a well barrow! Seems a bit difficult to believe in this day and age when we take running drinking water for granted. But there is something here that doesn’t stack up. Why would someone in the 1750’s build three cottages where there was no water supply? 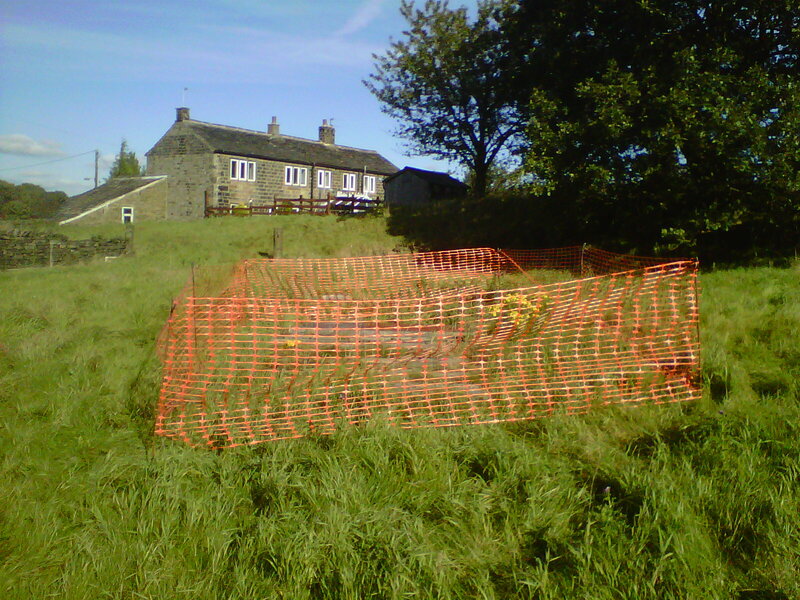 It is fairly common for old properties in the area to have their own well. Often very deep – 40-50ft would not be unusual. But there is no sign of a well on the property at all today. So where might it have been? I can’t imagine that it would have been at the rear of the property since there is no sign of any doors or access on that side. I can’t imagine that it is going to be directly in front of the cottages as this area forms a sort of farmyard. The access has not changed over the years so it looks like it has always been a farmyard. So the only other option is that it has to be located some where in the front of the property, beyond the farmyard, and in (what is now) the orchard. But still no sign. But it must be there somewhere. Surely. Here’s some more images of the property as it is today. You will have seen photos of the property elsewhere on the site (see here), as well as the architects drawings of the existing elevations (see here). However, the below image is a pseudo 3D view produced using Microsoft Photosynth. 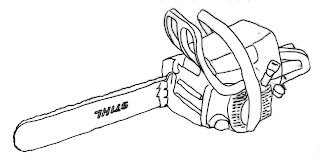 The image below will allow you to scroll left-right as well as up-down. There was taken on an early (and view cold October) morning. The sun is very strong and you can see my shadow in the foreground of the image. This image was constructed using Photosynth running on an iPod Touch. You may need to install Microsoft Silverlight to be able to view the image. Well, four days in – actually four half days – and this is how far I have got. And I keep thinking the next time I come here, I will reach the top (the top is just underneath the white wooden clamps). So I reckon that I am about half way up. Mmmm. I suspect that we will need to erect an electric fence around some of the field. Although the walls and fence are (for the most part) in reasonable shape, they are a bit low in places. Still, we will see. Well, it wasn’t really a whole day – just a morning as I got distracted. 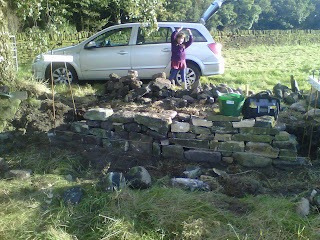 I spent about 3 hours this morning dis-assembling and digging out the footings for another 2m stretch of wall. I am being “less precise” with this stretch of the wall and doing the best I can with the current wall stone. 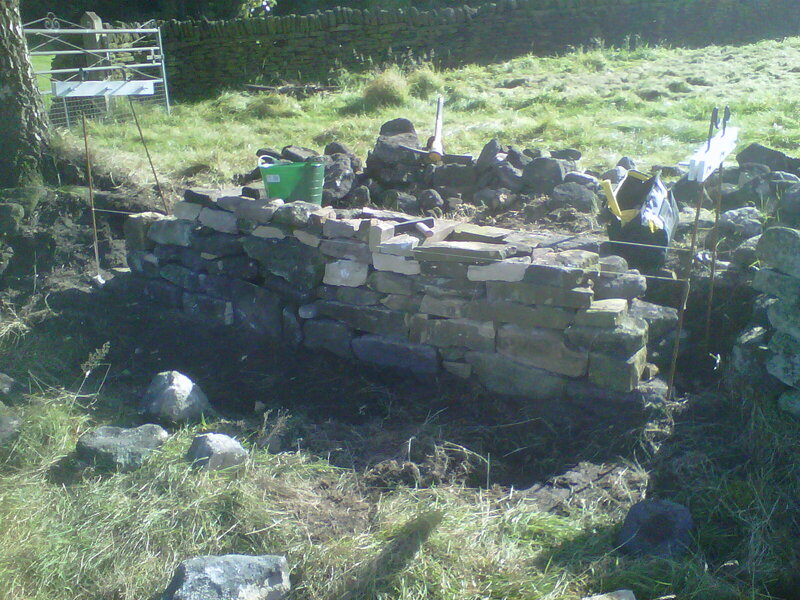 Yes, it is horrible and rounded, but for this field wall I am just going to have to do my best. Shipping in huge amounts of new stone to build a field wall seems like a huge amount of wasted time and effort (not to mention money!). 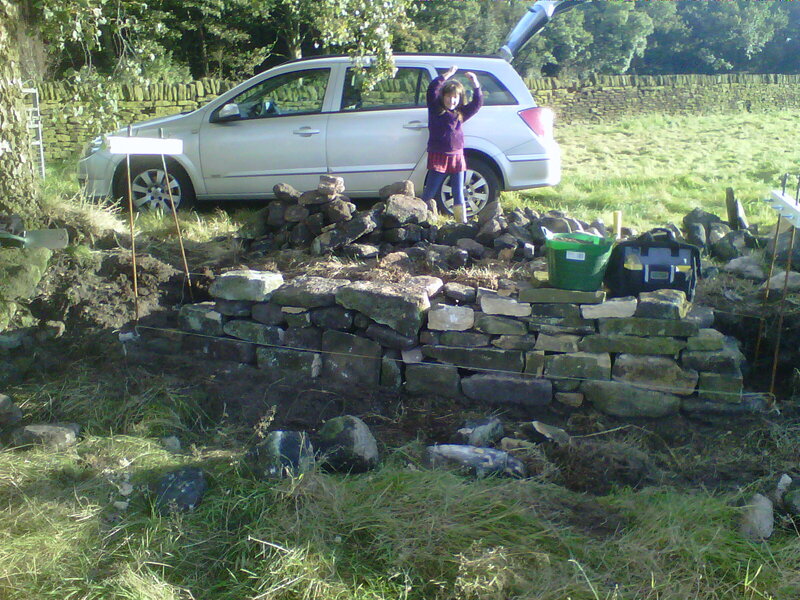 I am hoping that by the end of this weekend that I will have at least part of the wall up to the finished height. We will have to see. Not much to look at for 2.5 days work. I then faced two distractions in the afternoon. Firstly, measuring out where the new extension will be and marking this out on the ground. I haven’t got an electronic version of the plans, so haven’t had chance to post them here yet. Jo is concerned that you will be able to see into the master bedroom from the road. I took the new plans that we have and used road pins to mark out where the master bedroom is going to be. This was a useful exercise. We now know that it will be very difficult to see into the bedroom from road level. And if we are still in any doub, a small dry stone wall on the crest of the rise would totally block the view from the road. The second distraction was cutting the grass on the top field. 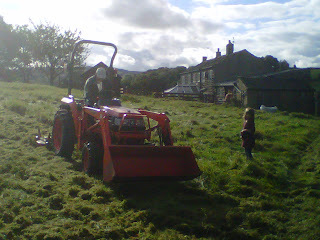 Rob kindly brought his tractor (and daughter – Ellie) to help with the job. It took about an hour or so to cut the grass. Strangely, it has a tendency to find all the stones in the field! This slowed progress, but I now think that the majority of the loose stones have been removed. We will have to see. This is the last time that the field will have to be cut this year. Rob showing the grass whose boss! Rob and Ellie – Houston we have a problem! 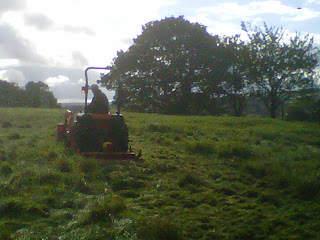 The lower field has a lot more of slope, so the current plan is to graze some sheep in the lower field to get the grass down to more of a manageable level. We just need to find out where we can borrow some sheep from!